48x24x60 Static Dissipative Coated Plenum Desiccator Cabinet 10 Doors: STI Systems and Technology International, Inc. 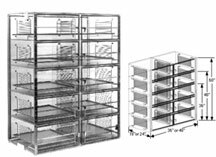 Ten Door 48x24x60 Static Dissipative Plenum Wall Desiccator Cabinet P/N 920182 offer a clean moisture free storage desiccator cabinet. A mini-cleanroom isolated from warehouse and manufacturing atmosphere.